NICI-Mania's food review segment is here again! 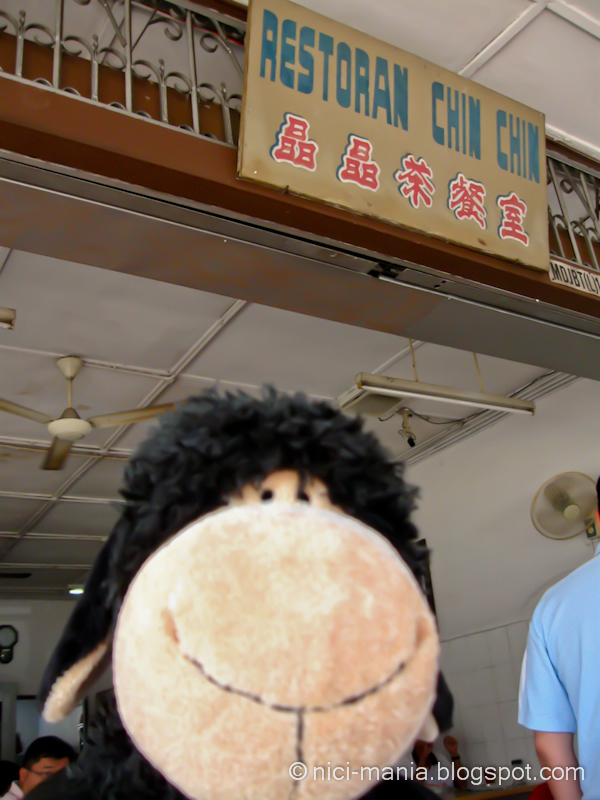 This time Jolly Ben travels to JB (Johor Bahru, Malaysia) to introduce a famous wonton noodle stall in Skudai called 晶晶云吞面 (Chin Chin Wonton Noodle). For our extremely supportive overseas friends, the term "wonton" literally means minced meat dumplings, so wonton noodle is a minced meat dumplings noodle. 晶晶云吞面 (Chin Chin Wanton Noodle) is located at the corner of the crossroads between Jalan Kaloi and Jalan Lawang near the main road Jalan Skudai. 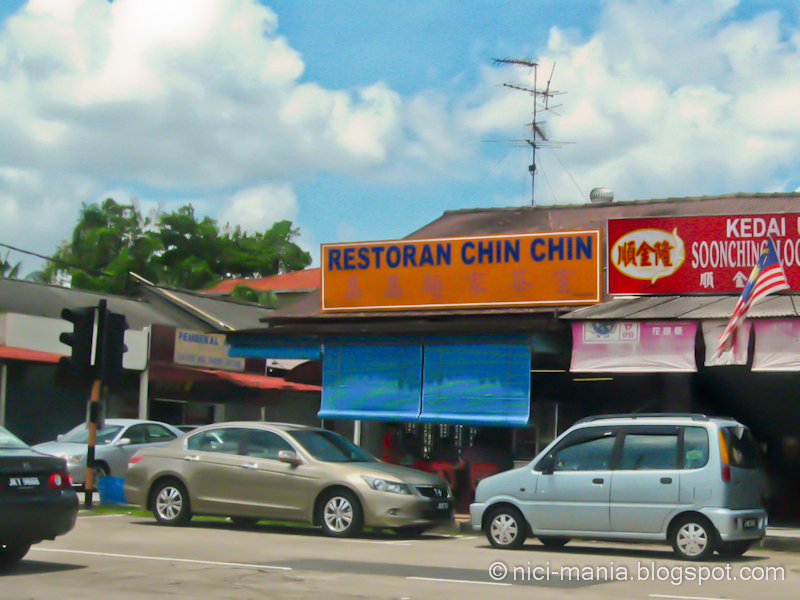 It is very easy to locate if you know your way around in JB (Johor Bahru). 晶晶云吞面 (Chin Chin Wanton Noodle) is a family business, you can see three generations working in the shop harmoniously together. Always a very heartwarming scene to see. 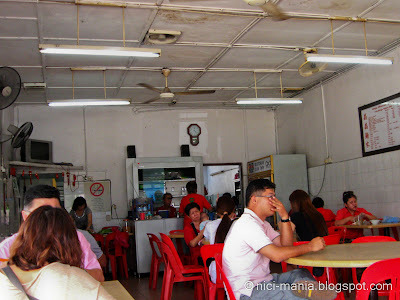 We could never forget the other time eating at this famous laksa noodle stall in Taman Perling where the stall owner (mother and daughter) was quarreling so blatantly in front of all the customers while cooking the laksa, which ended up in the daughter irately throwing the ladle and walking off in rage. 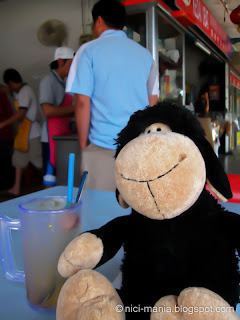 That qualified as the most memorable hawker food moment. Alright, back to wonton noodles. According to the owner, 晶晶云吞面 (Chin Chin Wonton Noodle) has been selling wonton noodles for more than 23 years, they started business started around 1988. Look at their classic signboard on top of their coffee shop. There is only one stall in the whole coffee shop, which means the wonton noodle here has to be good, or else people won't be coming here just to eat this. 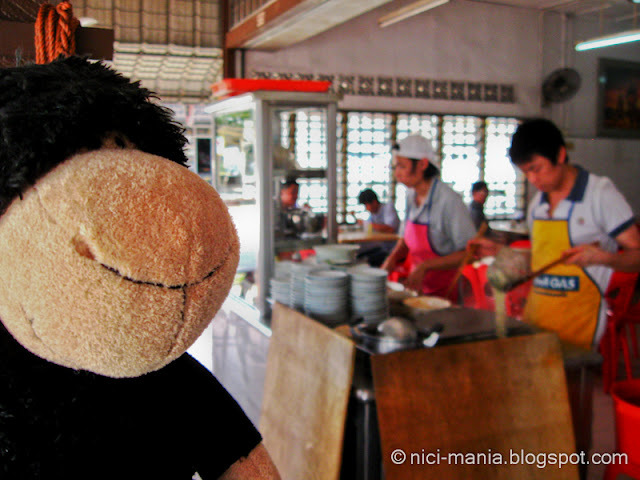 The general rule of thumb for hawker food in Malaysia is, your food must be really good to be able to only sell one type of food in the shop. Usually most coffee shops in Malaysia have at least 3 to 4 stalls selling different types of food. This is the young 2nd generation at 晶晶云吞面 (Chin Chin Wanton Noodle) cooking the noodles pictured above. The shop owner went off for a break when there were less crowd. Usually the shop owner will be the one cooking during the peak hours of Saturday and Sunday mornings when there are a lot of customers. If you come to 晶晶云吞面 Chin Chin Wanton Noodle on Saturday and Sunday mornings around 8-9am, be prepared to get hit with the biggest crowd at the noodle stall, sometimes you have to wait to get a seat but you can order first. Even with the insane crowd, their service is still extremely prompt. Last time we remember they added another stall on the right of the original stall to handle the takeaway customers, so the waiting time is reduced further more. This picture is taken on a Saturday afternoon around 12:30pm. 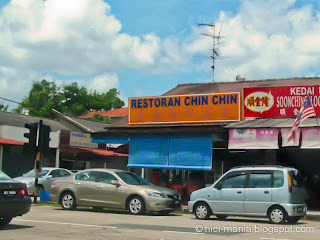 We have not been eating here during peak hours since a long time ago. Too hungry to wait for food on a Sunday morning, so Saturday afternoon is the best time to come. The first time we ate here was about 15 years ago. An old friend who was staying in Skudai nearby Chin Chin wonton noodle stall introduced this place after a basketball game. Memory was still extremely vivid of him saying that this wonton noodle stall is very special, the noodle taste very different from any other wonton noodle stall. After trying it for the first time, we got hooked by its unique taste and noodle texture and has been coming back ever since. You can simply walk up to the stall and order a bowl of wanton noodle before getting a seat, this is what we usually do. You will immediately be asked whether you want it spicy or not. For first timers, we always recommend to try the non-spicy original taste. There are 3 sizes of noodle, small, medium or large. Small is just enough for a petite lady or a 35cm sheep plush like Jolly Ben. If you are a guy, you definitely would wanna order large or two bowls! What's that drink beside Jolly Ben? Freshly squeezed lime juice with sour plum! This is the must order drink here at 晶晶云吞面 Chin Chin Wanton Noodle, especially when the weather is so warm. 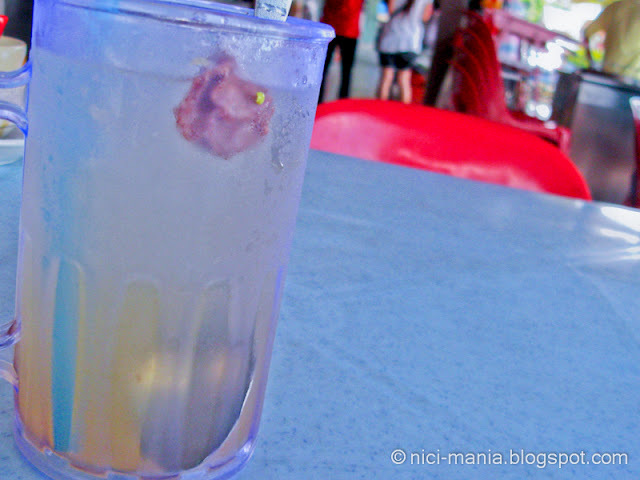 Sour plum lime juice is a definite thirst quencher! By the way, how do we know it's freshly squeezed? You can actually see the person squeezing the limes into your cup after you order, and they are very generous with the limes. Our wanton noodle is here! It only took a few shots of pictures with Ben in less than 3 minutes for the noodle to arrive at our table. They are trained to be this fast to handle the monstrous weekend morning crowd. 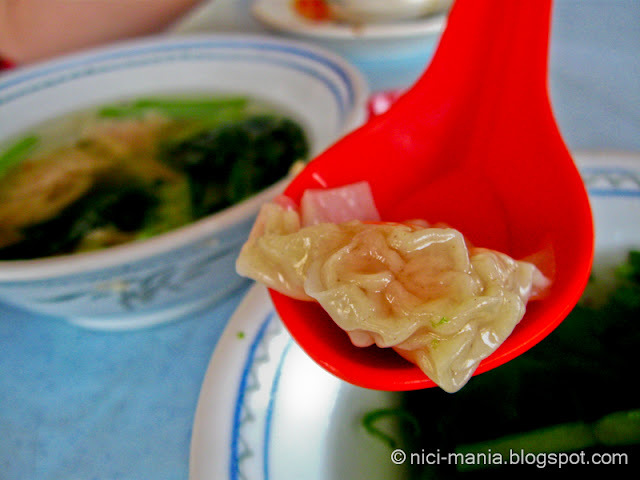 The springy noodle here is the main highlight at 晶晶云吞面 Chin Chin Wanton Noodle. Their noodles are handmade by themselves according to our friend who was an acquaintant with the noodle maker. What sets this wanton noodle apart from other stalls is the white colored noodle. Most wanton noodles are dark colored as they use dark soy sauce for the flavoring. 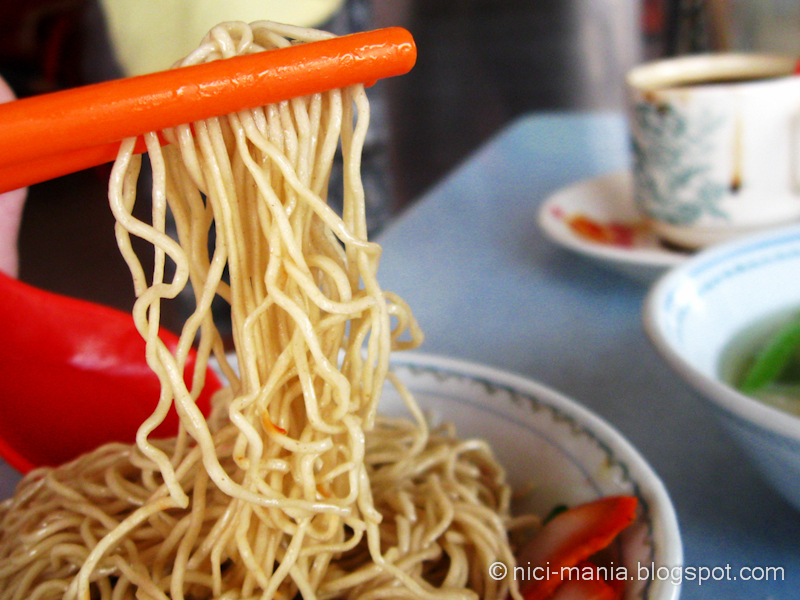 There is a choice of 'mee kia' or 'mee pok' for the noodle. 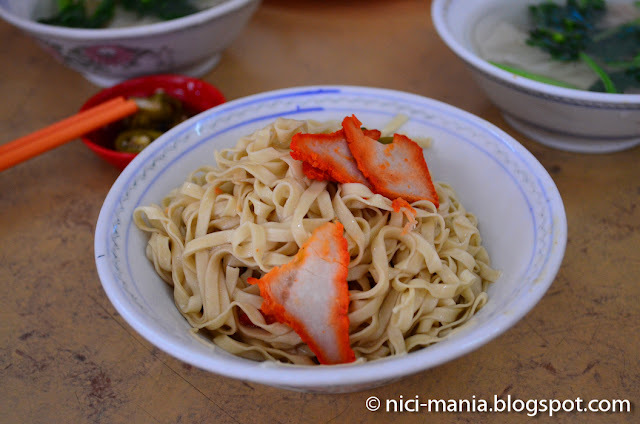 'mee kia' is thin noodles like spaghetti and 'mee pok' is flat wide noodles like fettuccine. By default they will give you thin noodles, which is our recommended choice here. 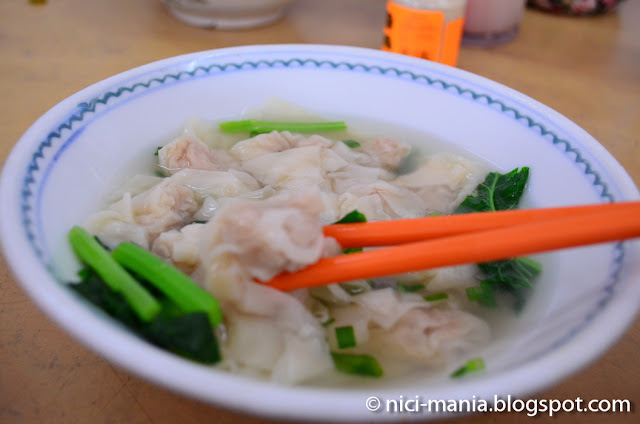 The wanton here at 晶晶云吞面 Chin Chin Wanton Noodle is another highlight of the stall. The minced meat wrapped inside is soft and tender. It has a delicious unique salty taste no other wanton stall has and unlike most wanton stalls that likes to add too much flour to make up of the lesser meat, the wanton here taste of pure meat. The secret? Well, we love cooking as you know and we cooked our own wonton too, adding pork fats is what will make the mince meat soft and tasty, it's a secret everyone should know if you're into culinary. The only secret we will never know is, what condiments did the owner at Chin Chin Wanton Noodle add to make their wonton so tasty because we could never replicate the same taste. This green chilli pickle our personal favorite. Green chilli pickles always comes together with any wanton noodle, it is like how pickled cucumbers are married to cheeseburgers. 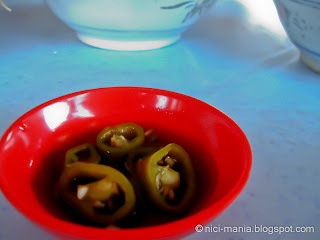 Most noodle stalls fail to notice the importance of these green chilli pickles to the wonton noodles. All of which we have eaten is either too sourish or too soft but here at 晶晶云吞面 Chin Chin Wanton Noodle, the green chilli pickle is marinated to perfection. It has the perfect amount of sourness and it retains its crunchiness just like fresh chillies. Every time we request more of these and the stall owner has always been very generous give more. 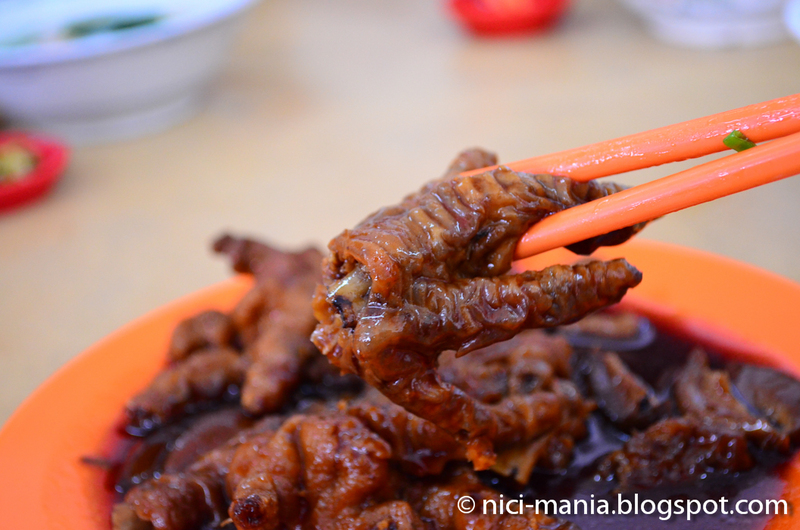 Ordering a plate of braised chicken feet at Chin Chin Wanton Noodle is one of the usual things to here. 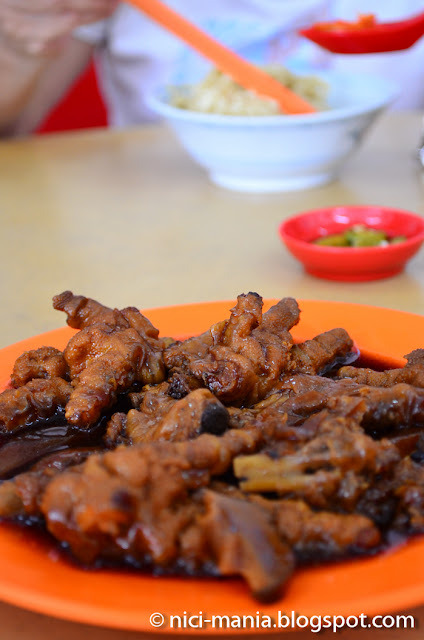 You will be surprised that they make very delicious braised chicken feet besides their wonton noodles. 晶晶云吞面 Chin Chin Wanton Noodle is a must try if you ever come by Skudai, Johor Bahru. Because of it's unique taste, either you will love it or you will loathe it. 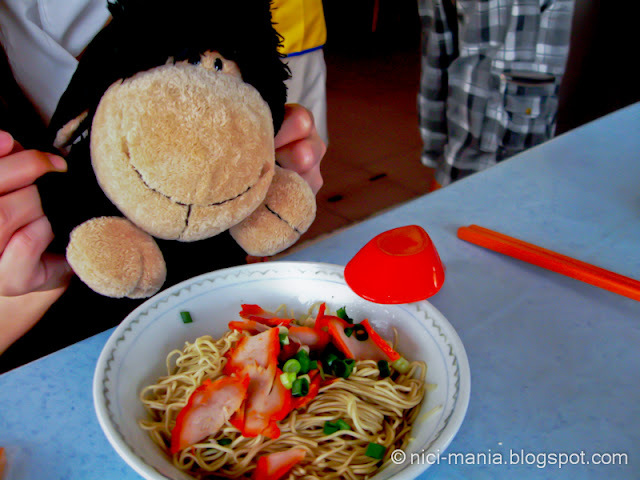 Some of our friends from Singapore dislike the taste because the wanton noodles they are used to eating is an entirely different species, but most people here love it that's why its so popular. Most of times, small familiar businesses are the best places to eat! 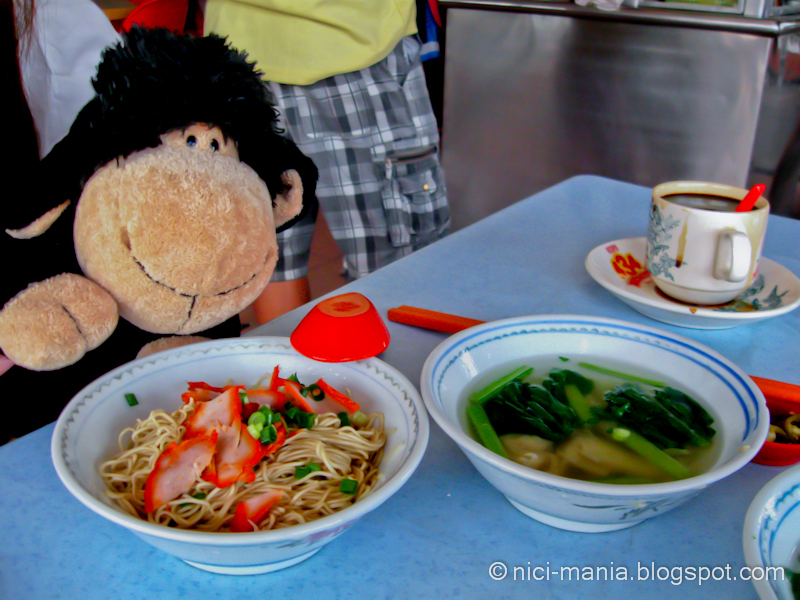 I would like to try those noodles, specially if they are spicy, I love spicy food! There are many " version" of wanton mee, but this version is amazingly unforgettable! The noodles are without much seasoning sauce, means you can taste the original flavor and texture of the noodle. And i like the bowls they're using, such a reminiscence of our good old days! There will be a lot more food reviews to come in the near future!